Make Pizza Dough in One Minute! I don’t know anyone who doesn’t love pizza. I guess that’s why our Pizza Class was a big success on Thursday, October 6. I put on my Pizza Chef’s hat and everyone else put on their Creative Hats to create some fresh, delicious and beautiful pizzas all in a Flash…just 6 or 7 minutes in the oven…Really! I was glad to have a couple children to show how easy making home made pizza dough can be. There seems to be some mystery about making the dough, but it is truly the easiest part of the process. Well – super easy that is – if you have a Cuisinart or food processor – my favorite piece of equipment in the kitchen – that will make your dough literally in a flash. A Kitchen Aid or Sunbeam mixer with a dough hook would work just as well. Hannah, our 11-year old Sous Chef made the dough in a couple minutes and then Neil, a 10-year old showed us again how easy the process is by making the dough himself with a little guidance from the class. Later he asked his Mom if he could help cook dinner at home. About then, she was very glad she signed up for the class! In the case of making pizza, it is difficult to learn how to make the dough by reading a recipe. A picture is worth 1,000 words, as they say. I had the class roll out their dough, and place it on a sheet of parchment paper, so that we could scoop the pizza peel underneath it and transfer it to the oven. We kept the oven temp at a cooler 450° so that the parchment paper wouldn’t burn. This also helped with cleanup, as we didn’t have as much spilled all over the pizza stones or landing on the bottom of the oven. Susan cooked a pizza crust on the grill and then slathered on goat cheese, fresh fig slices and arugula. This was fresh, different and excellent. The pizzas were coming out so fast and furious that I didn’t get to snap pictures of most of them before they were gobbled up. 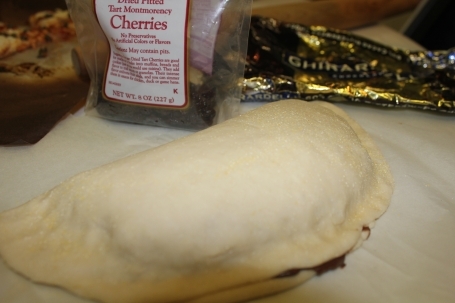 Then everyone started making Calzones for dessert using chocolate chips, Nutella, dried cherries and pineapple. Some had sugar sprinkled on top and inside. What a great idea! A child’s 2 fav food groups – pizza and chocolate together-Awesome! Place your baking stone into an oven and preheat to 500° (or 450° if using parchment paper). You want the stone really hot, to achieve the best browning on the bottom, so have it in the oven at least 1/2 hour before using. you have only one peel. 1. Combine yeast and sugar in ½ cup warm water. (This is called proofing the yeast). Wait until you see the mixture foaming. 2. Measure flour into bowl or Food processor. Add olive oil and salt. If using food processor, with motor running add yeast mixture. Then add enough warm water to bring all ingredients together into a moist, but not wet ball. Oil your fingers when working with dough to prevent sticking. 3. Divide your dough into three balls, place on a tray or bowl and cover with plastic wrap. Leave in a warm place to rise until double its size – about 45 minutes to an hour. You can leave it sit longer and then continue to punch down the dough and let it rerise. Or you can place in refrigerator and bring up to room temperature the next day before using. 4. To use, place one ball or disc on a well floured surface and roll it out with a rolling pin. Turn the dough a ¼ turn after each roll and reflour surface frequently to prevent sticking. 5. You are ready to top your pizza. Sprinkle cornmeal on your pizza peel or parchment paper. Place dough circle on paddle or paper. Top with your favorite toppings – minimize liquid in your ingredients for maximum success and best browning of bottom. 6. Slide your pizza from the peel onto the hot pizza stone in the oven and bake about 6 minutes (longer for a thicker crust) or until crust and cheese begin to brown. Click on the frog to see more Tomato and Zucchini recipes from the Food Bloggers of Los Angeles. Entry filed under: Appetizer, Bread, Cooking Class, Dessert, Entree, Food, Food Blog, Italian, Recipes, Vegetarian. Tags: Chocolate, cooking class, pizza. Thanks for visiting. I look forward to seeing more of your recipes also. Patricia, I love this! What a fun class! Love the fresh herbs with the figs and goat cheese. Beautiful!